And so it went. 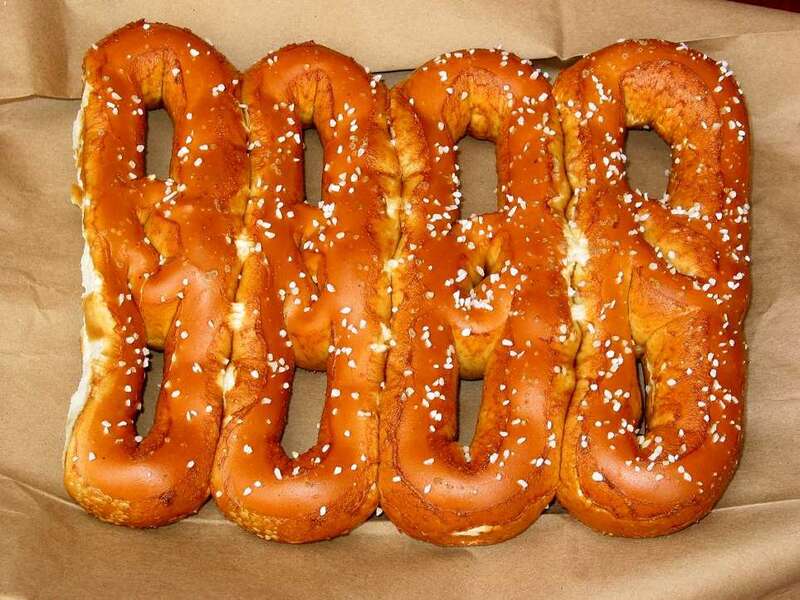 By the time I came along in the mid 1980s, pretzels had been a Philadelphia staple for almost 200 years. Every class party, every field trip, every football game, every city street corner featured Philly pretzels. Oblong, crusty, salty, and moist on the outside, white and soft on the inside, and squeezed together shoulder to shoulder. Another fun fact, courtesy of the Pretzel Museum (now closed) is that “the average Philadelphian today consumes about 12 times as many pretzels per year as the national average.” Though not validated, this statistic seems conceivable to me. My dad was one of those Philadelphians consuming an overabundance of pretzels, though I suspect he beat even the Philadelphia average by a few standard deviations. I have no evidence that dads in other cities don’t eat large quantities of pretzels, but what I do know is that my dad loved them so much that when I was asked to make a paper tie for my dad for Father’s Day in fourth grade, I covered it in hand-drawn pretzels and half expected him to take a bite. Very recently my dad has taken his foot off the pretzel pedal, and now Palate Guy has assumed the mantle of pretzel eater-supreme in my life. The soft pretzel here recipe looked (and was) so easy we were sure it wouldn’t work or that it wouldn’t actually produce pretzels that tasted like soft pretzels. But we were wrong. Palate Guy and I were so impressed that we ate all 4 pretzels in one sitting, and we can’t wait to make them for my Dad and any other Philadelphia residents that are willing to give us a shot. Adapted from Alton Brown’s recipe here. We halved the recipe shown here and used a stand mixer to whip up the dough before letting it rise. Hand kneading would work too. 1. Mix first four ingredients (warm water, yeast, sugar, and salt) in the bowl of a stand mixer. Let sit for 5 to 10 minutes until the yeast foams, and the water is uniformly murky. 2. Add flour and butter to the bowl and mix on low using the dough hook attachment until combined. 3. Increase the speed of the dough hook attachment to knead the dough until smooth, about 5-7 minutes. 5. Preheat oven to 450 degrees. Grease 2 baking sheets, line with parchment paper, or whip out your Silpat (silicone cooking mat – this is what we used). 6. Mix 2/3 cup baking soda into the 10 cups of water and bring the mixture to a boil. 7. Lightly oil a working surface. Cut or rip the dough into 8 pieces of similar size. 8. Roll each into a long rope, about 2 feet long, and then form a pretzel shape. To do this, make a ‘U’ with the dough, cross the ends over each other, then press each end onto the bottom of the ‘U.’ A better explanation can be found here. 9. 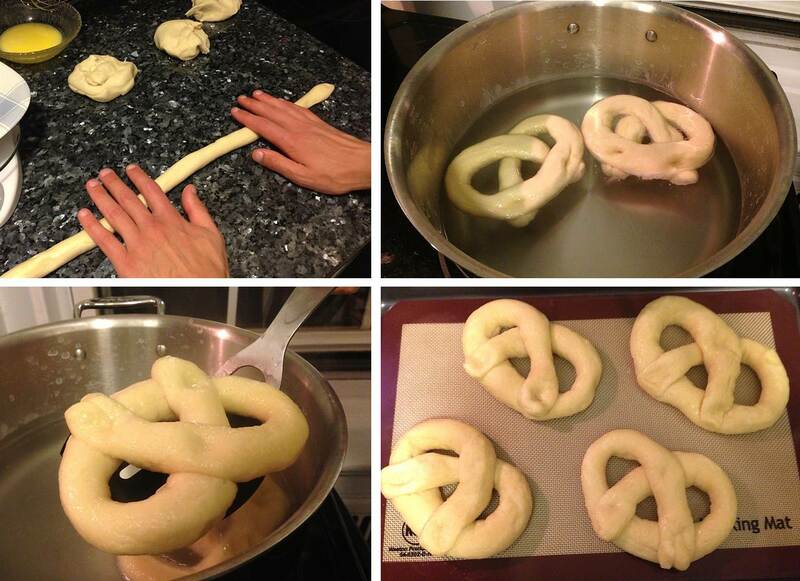 One by one, place each pretzel in the boiling water/baking soda mixture for about 30 seconds. Remove each from the pot and place on the baking sheet. 10. 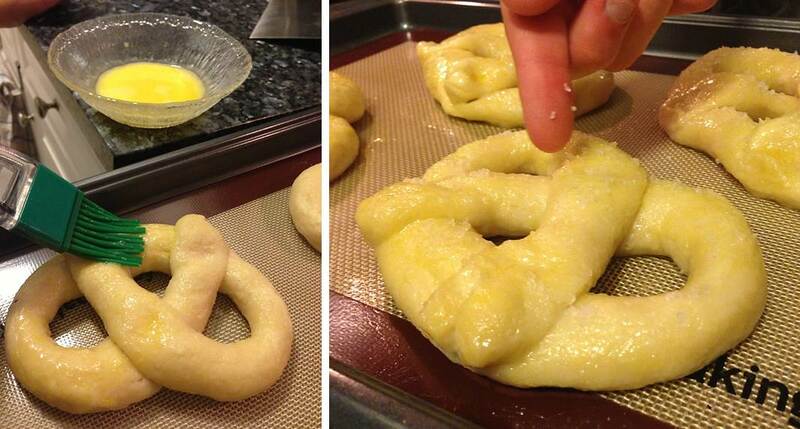 Lightly coat each pretzel with the egg yolk and water mixture and sprinkle salt on each. 11. Bake for 12-14 minutes or until dark brown (but not burnt). The real question is. . were they as good as the pretzels we got from the SRS pretzel order?? Wow – blast from the past! I doubt they are as good as the SRS pretzels. Enter your email address to follow PalateGal and receive notifications of new posts by email. Looking for a type of dish? Have an ingredient in mind?